"I want only the best!" Cat parents, your feline has some specific needs surrounding scratching. She doesn’t scratch the sofa because she wants to destroy it. It has the qualities your cat seeks, such as stability, texture and height. 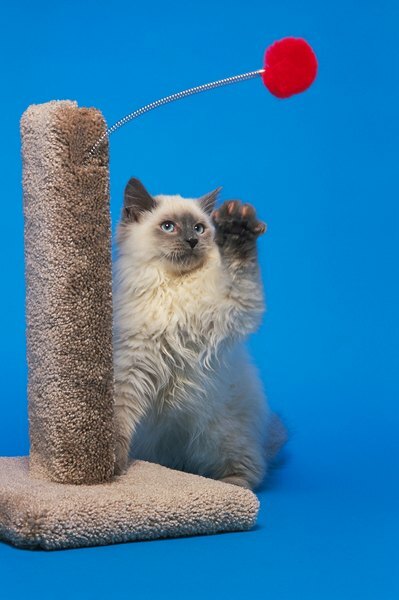 Scratching posts that have these qualities win two paws up from Fluffy. Sisal, carpet or bare wood -- your cat has some strong preferences for scratching surfaces. Far from being willfully destructive, your kitty scratches for good reasons. She needs to get rid of that outer cuticle on her claws. Scratching helps her to stretch and unkink her muscles, and it’s just plain relaxing. Look at the objects in your home that she’s scratched. She might prefer plain wood over that beautiful, expensive carpeted post you bought. Her claws could get caught in the carpet loops. Sisal’s roughness and allows her to dig her claws in for a good, satisfying scratch and stretch. If she loves wood, give her a wooden post. It’s better to have to sweep up bits of clawed-up wood than to deal with still more scratches on your hardwood floor. When your cat wakes from a long, comfortable snooze or finishes eating, she might enjoy a good scratch session at the scratching post. If that post you bought has a narrow base and she leans her full weight into the post, it’s going to go toppling over and scare her. If this happens often enough, she’ll develop a justified aversion to that particular post. It might cost you a few more bucks, but it’s worth it if a good scratching post has a wide base that prevents tipping when she leans on the post. Think about it -- your kitty needs to stretch, stretch, stretch her back muscles after she’s napped, and a strong base on the scratching post serves this purpose perfectly. If Sasha is a long girl, she needs a scratching post that’s tall enough for her to get a good stretch in. Those short posts are ideal for kittens and smaller cats, but for your kitty, it won’t give her the chance to stretch as she scratches. As soon as she figures this out, she’ll bypass it in favor of your hallway wall or that long piano leg in the living room. That won’t do, cat parent, so acknowledge her need for a taller post. In addition, if she’s been stretching and scratching on a wall, a taller post strategically placed right in front of that scratched spot could help her to divert her scratching to an object you want her to scratch, not an area you’ll have to keep repairing over and over. Don’t forget to exercise your ingenuity and ability to make your own scratching post. You know your cat’s needs and preferences best, so pull together her preferred materials and make a post for her. This could mean salvaging wood and carpet scraps and ordering sisal rope. Build a scratching post to your feline’s order. Instead of securing the carpet scraps with the carpet side out, switch it around and glue it on with the base side facing the outside. If your kitty prefers plain wood, ask the cutters at a landscaping company if they will allow you to take wide tree branches they’ve cut from a customer’s tree. The landscaping manager might allow you to take a portion of a tree trunk before taking a load to the landfill. Clean these off with a good jet spray outside, allow them to dry and bring them inside, then allow your kitty to go to town on them. What Does It Mean When a Cat Waves Its Paws? Do Cats Walk Funny After Declawing? What Does It Mean if a Mother Cat Is Growling at Her Newborn Kittens? Does De-clawing Your Cat Cause Biting? Does Cutting Claws Make Cats Stop Clawing?